Club Penguin Cheats by Mimo777 Club Penguin Cheats by Mimo777: Club Penguin June Sneak Peek! June 16: Music Jam = party time! 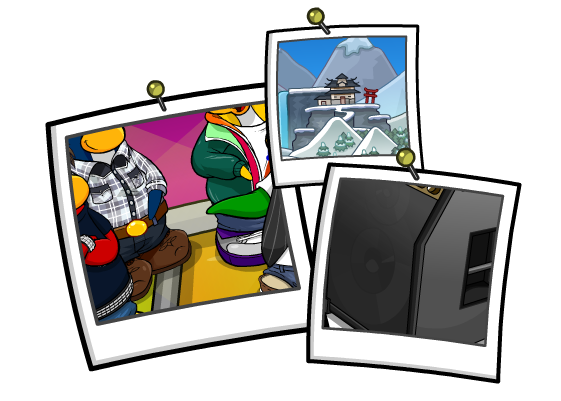 Lookin' pretty smoove, Club Penguin! Hmm, new ninja items? Could it possibly be the Shadow Ninja stuff? Okay.. the first picture is maybe free member items at the Music Jam? The right top one is I think the snow jitsu (YAY!!) and the bottom right is a music speaker. theres no menu on club penguin u can't say anything. OMG I am so mad! My membership expires the day before the items come out! GRRRRRR! The SNOW ninja maybe! See the new mountains in the top picture? Those look like new clothes and the disco floor on the left, and the third looks like a amplifier. Mimo, I've just entered the Pet Shop and the entire room was blank. I selected Plaza on my map and I entered again. The Pet Shop was normal. Maybe, the CP moderators do some changes. The dojo isnt new items. It is actually what it's going to look like on Club Penguin's updated map!!! no it cant be the new shadow ninja i dont think you can earn the shadow ninja till you master all fire,water,and snow. The dojo pic must be for the new map!